A dab of blue here, a splash of red there, a goopy smear of green . . . everywhere. To the tune of "It Ain't Gonna Rain No More," one creative kid floods his world with color, painting first the walls, then the ceiling, then himself! Before this feisty artist is through, he'll have painted his head, back, hands, legs, feet, and . 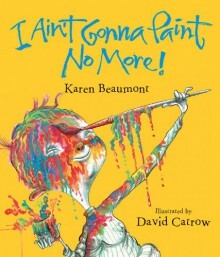 . . Oh, no, here comes Mama!Karen Beaumont's zippy text and David Catrow's zany illustrations turn an infamous childhood activity into raucous story-time fun, giving a silly twist to the fine art of self-expression. Now in board book format! http://karaswiney.booklikes.com Miss. Swiney's Classroom Library 5.0 I Ain't Gonna Paint No More! text I Ain't Gonna Paint No More!